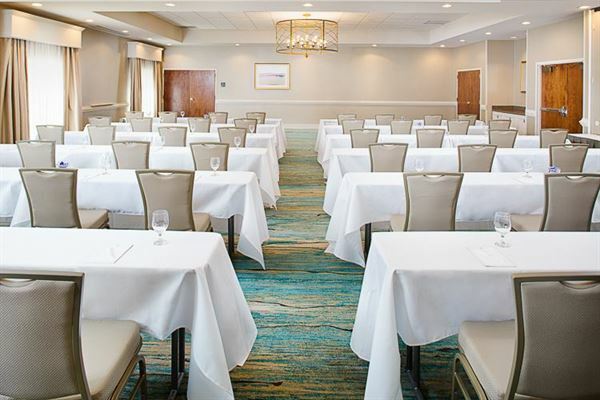 Arranging your next group meeting, event or Miramar Beach wedding is simple at the Embassy Suites by Hilton Destin Miramar Beach hotel. The location speaks volumes, and our Destin, FL resort provides flexible event space for board meetings, banquets, and conferences. Our event space features include: • Over 6,000 sq. ft. of meeting and event space • Flexible Emerald Coast Ballroom that can be broken up in several ways and accommodate up to 400 people • Two Board Rooms for up to 12 people • Up to date Audio-visual Equipment with dedicated A/V technicians available upon request From Miramar Beach weddings to business meetings and events, the Embassy Suites by Hilton Destin Miramar Beach can accommodate just about anything and offer personalized catering. Let our expert staff help you customize a menu and make your next event memorable.